We have some really cool pictures of the process to show you... but unfortunately... since their line is so comprehensive... we can't show you each button they make! 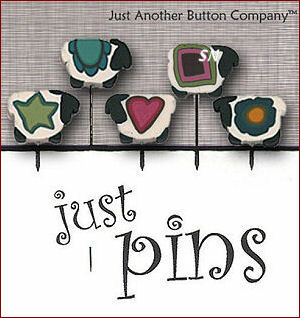 Refer to your patterns, and you'll most likely see JustAnother Button Company featured on them! Below, you will find a place where you can write in any JABC buttons you need. 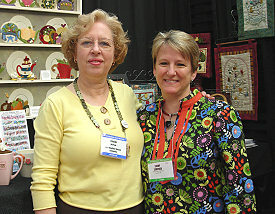 These gals bring our industry HUNDREDS of different hand-made button embellishments for our needlework! 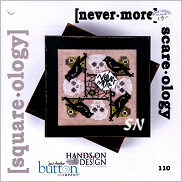 Found on patterns everywhere... Just Another Button Company buttons are made from polymer clay. The artists create the 'picture' in a long 'cane' of clay... rolling and stretching the straw-like rope of material. When it's just the right diameter or size... they slice the clay, bake it, and then drill teeny-weeny holes in every single piece. Use the comments box on your web order to tell us just what JABC Buttons or Buttonpacks you'd like! 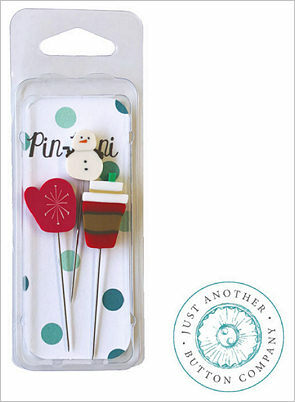 JABCO has made 21 sets of decorated pins to poke into anything that needs something cute!!! 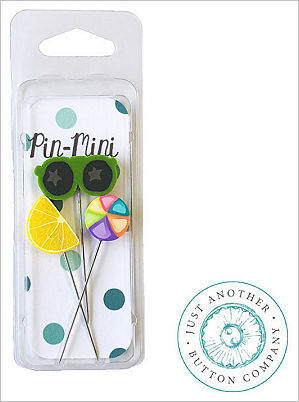 So many pin cushions and sewing cases out there... here are cute pins for them ALL! We have them all pictured below... I chose little fruits, some seashore ones, and a darling chicken-and-the-egg set to show on Just Arrived, but make sure to see the rest! 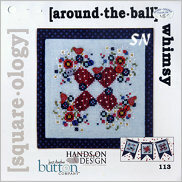 #418 Is featured on Hands On Oh Say Can You Sea, and #430 is featured on Hands On Farm Fresh. WE HAVE A SPRINKLE AUTO-SHIP! CALL US NUTS! This auto began in March of 2018; we expect to finish in March of 2019. This is a small ornament design that is only PARTIALLY stitched! Just Another Button Company is printing the design on 14ct white perforated paper. You leave most of it alone, but stitch the orange pumpkin and garnish with the yellow buttons on the corners, the Jack's eyes, and the bat. You supply the black, white and orange floss from your stash, buttona are included. Finishing only 3 x 3-1/2 in size, this would make a really GOOD beginner design for someone to learn Cross Stitch. The paper is strong, the design in technically printed on, so really no counting... it's small and colorful and seasonally CUTE! A pair of cute 3-1/2 inch ornament designs, these are both stitched on the 32ct Natural Belfast linen featuring little white polka dots painted on the fabric. 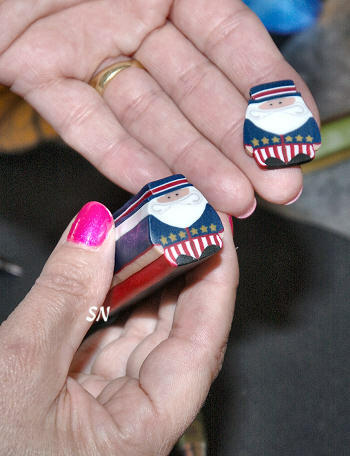 Each comes with its button embellishments -- isn't that round of red trucks CUTE? Finish inside a 4-inch wooden hoop as shown, use Square-ology's white enameled candle pans, or simply make stuffed cushion ornaments or flats backed with felt! Lots of options... but get the polka dot linen for sure! 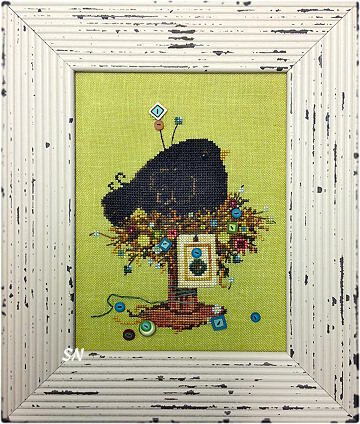 JABCO and Hands On Design have announced their 2016 Chalk Series for Cross Stitch. 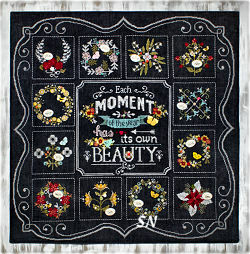 Quite involved with different finishing choices this year, you can stitch JUST the central square -- *Each moment of the year has its own beauty. * or you can make it the central part of the larger piece. 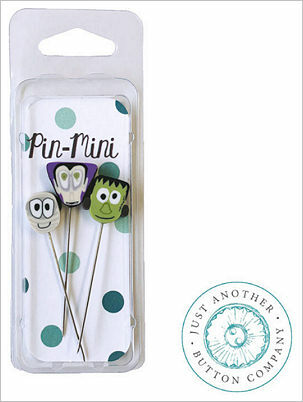 There are 12 little parts coming monthly that you can finish in individual candle pans (make them magnets or whatever) OR you can stitch those right onto the larger piece. THEN, of course, there are button sets each month... so we have TONS of details for you! ***A Moment in Chalk -- OK... this is the central design of the series. 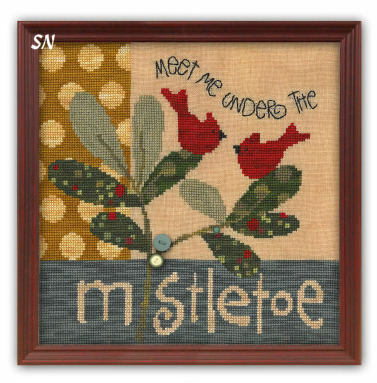 You can stitch just IT (135 x 135 stitch count) on the 30 or 32ct Gunmetal Weeks Linen (8-1/2 or 9 inches square when finished) with hand-dyed Gentle Art Sampler Threads. OR, you can stitch it in the center of the larger piece -- 317 x 317 stitches, that will finish 20 to 21 inches in size -- depending on whether you use 30 or 32ct linen. That larger scrolling border is included in this first chart. 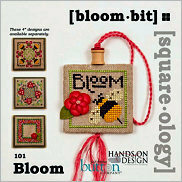 ***Individual Calendar Florals -- These will release each month -- the smaller charts. Jan, Feb and March have now arrived. 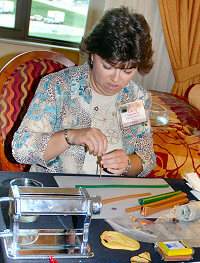 You'll need 9 x 9 cuts of linen for each and a little 4-inch white enameled candle pan -- if you stitch them individually. If you add them onto your main 317 x 317 piece, the first chart will tell you where they go (no candle pans needed then). ***Enameled Candle Pans ***Button Packs for each Calendar Floral -- we are offering these together with the charts, but prices will vary each month -- per JABCO. ***Linen is Week's 32ct Gunmetal. 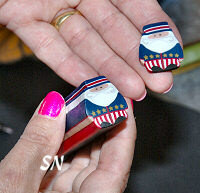 Last year's set used a 1/2 yd cut of 30ct. If you still have that left -- you can USE IT! It'll change your total design area by 1/15th of an inch every inch. Basically it won't matter much for the finished pieces -- not enough to buy new linen anyway! Regular Moment in Chalk will need a 15 x 15 cut. Huge conglomerate project will need a fat 1/3 yard -- 27 x 27 cut. 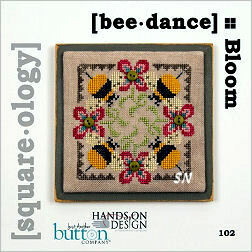 Each month's design will need an 8 x 8-ish sized piece... that's a half yard. So, probably figure a yard... it's the most economical way to purchase this. (that's if you choose the candle pan option!) CONFUSED YET???? ***Threads: Tropical Ocean, (3) Grasshopper, Rhubarb, Melon Patch, Huckleberry, Aged Pewter,Harvest Moon, Geranium, (6) Chalk, Buttercrunch, Sweet Petunia, Wood Smoke, Shutter Green, Green Apple ($52.50) and a bit of black DMC. ***BACK BOARD for Middle Design -- A gorgeous soft blue whitewashed and distressed finish, you can see the shaped edges peeking out from behind the main Moment In Chalk design -- if you stitch JUST it. So Stitchers.... We suggest a phone call to consult about fabric sizes, which way you want to do this set... pans vs fabric, finishing kits vs not... whew! Dropdown options are for individual projects on 30ct. They are actually white 5-1/2 inch squares of 14ct perforated paper that JABCO has printed with stripes, spots or hearts of beige, pinks and greens. Each letter, also printed in black on the paper, features its own background... meaning all the M's have the pink stripes, but other letters have different colored stripes! 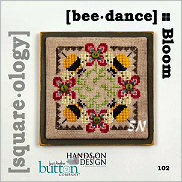 Stitch a little or a lot -- they have charted only a small floral design for each, and provided buttons for garnish. You supply the bits of floss from your stash. SO cute, colorful, fresh, bright, clean and cheerful... you can stitch just one initial or spell out a huge long greeting! Just depends on your budget! 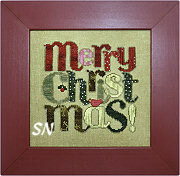 Frame or finish on scrapbook papers -- you decide. This is a small chart stitched predominantly in Sampler Threads of denims and teals, mossy greens and dark brick colors. Four little buildings in the village -- all gathered around the center park, it's very organized! 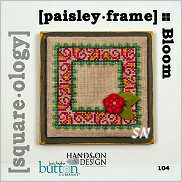 Pretty colors, it finishes approx 7 x 7 on Weeks 30ct Parchment linen, and comes with a set of 7 JABCO clay buttons as garnish! So cute, this is quite a unique presentation. The cat body and pink swirls are printed on 14ct perforated paper. 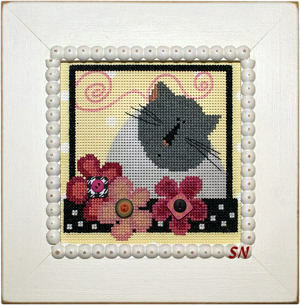 You stitch the flowers and cat face from the chart, embellishing with the smattering of colorful JABCO buttons! Then, place the coordinating printed sheet of paper behind the perf paper -- all the holes will be filled in with color -- and frame in a 5 x 5! This is REALLY cute! All you add are the flosses. 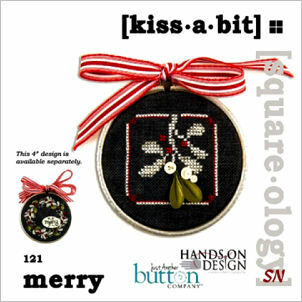 The Square-ology gals have a pair of new designs to help with the Christmas mood! 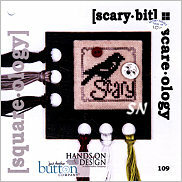 This set of designs is presented in card format with the clay button embellishment. You get 1/4 of the design, and then pivot it 90 degrees to repeat it over and over until you get it finsihed. EXCEPT the Bit -- which is just a stand-alone design. Confused? Don't worry about it. 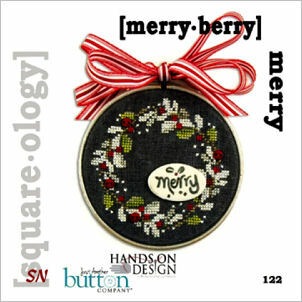 30ct Weeks Gunmetal Linen, bits of hand-dyed floss... the fob finishes 2 x 2, the Merry Berry wreath is only 4 x 4. Very pretty! 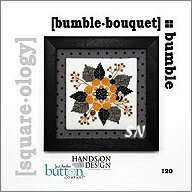 A pair of cute new Square-ology charts have arrived -- a small bee fob design and a Bumble Bouquet. 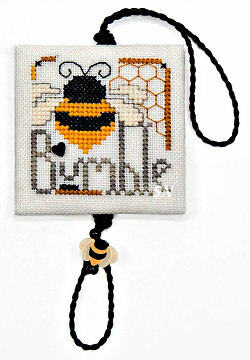 Offered as the small charts with the button smattering, there is a darling new JABCO bee featured on these. 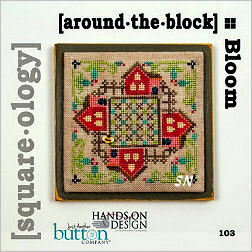 Part of the Square-ology Series by Hands On Design and Just Another Button Company... you might not want all in the sets so far... but some of these are REALLY stunning little designs! 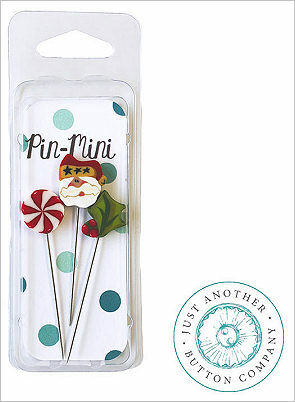 They are all pin cushion or fob sized as well. 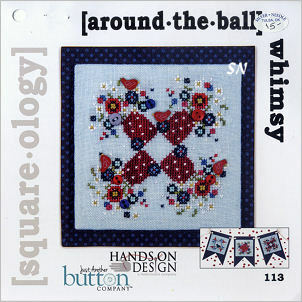 Offered as the chart with 'Square Bits' -- the buttons! 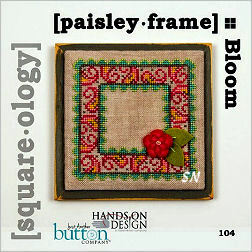 You've probably seen lots of advertising for this new series of small patterns... Basically, they are 4-card sets of coordinating designs -- each offered with a small embellishment packet. What makes them a bit different is the chart presentation. 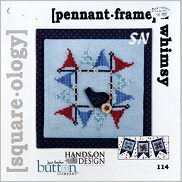 Each design is presented as ONE-FOURTH of the total charted design. (except one! So try to keep that straight!!!) 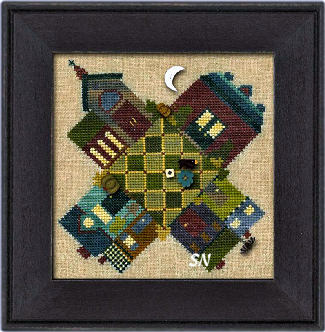 You stitch the design, and then rotate the chart to continue stitching the other 3 corners of the piece. Don't get lost in all those directions... you'll see when you get these that they are fun and very easy. Each chart comes individually with a beautiful picture of the finished piece on the front, along with its cute embellishments. We are promised a new set of 4 designs every other month! Since there are 4 in here... and embellishments... we are not putting everything on auto-ship -- we are leaving chart choices up to you!!!! This is the first chart in the charming set of Art to Heart's Garden Song Designs! 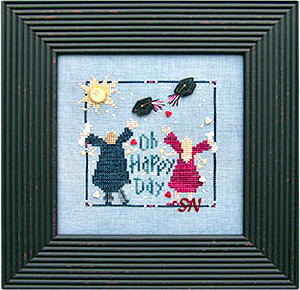 Originally in Quilt and Applique, we now get these happy designs in chart format!!! 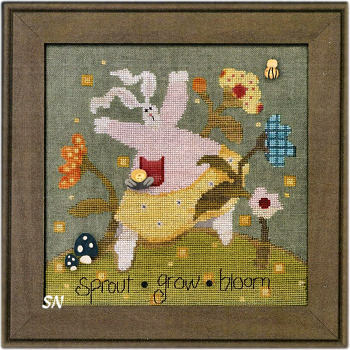 *Sprout*Grow*Bloom* features a leaping lady amidst her Springtime Garden of flowers. 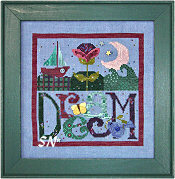 Stitched on Weeks 30ct Dove Linen it measures 7-1/2 x 8 and uses both Weeks and Gentle Art flosses. 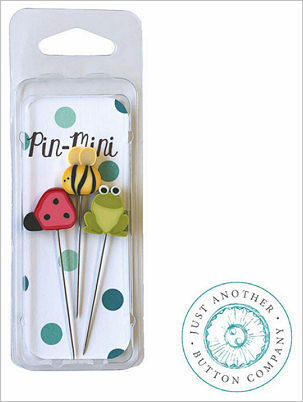 The button embellishments include a bumble bee, yellow flower and two DELIGHTFUL fat little polka-dot blue mushrooms! That magnet I mentioned -- one of those soft, flexible ones with shiny front -- that is included as a bonus is a approx 2-1/2 x 3-1/2" and you can use it WHERE-EVER you want! 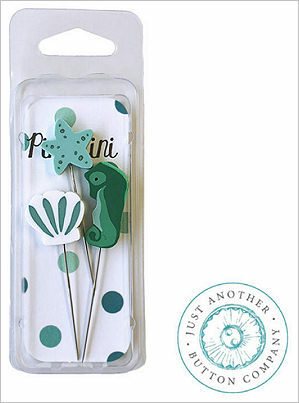 I know there will be more designs to follow that coordinate with Sprout --I just don't know the release dates yet. We'll let you know! 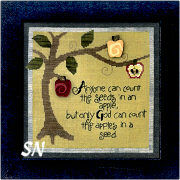 *Anyone can count the seeds in an apple, but only God can count the apples in a seed. * Just a little motivational thing to foster hope! What will come of the seeds you plant? Offered as a chart, this is stitched on Weeks 30ct Grasshopper Linen in only 7 different shades of hand-dyeds. 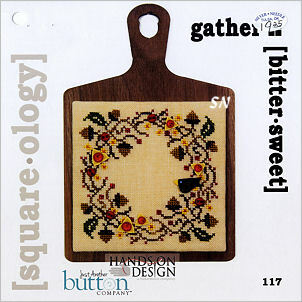 The included buttons are big apples and tiny seeds... and the cute bonus magnet features a trio of stylized apples. 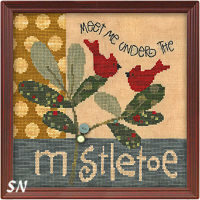 Finished size is 8 x 8... I think this might be the quintessential teacher gift!!!! Take time to have a little fun! *Dilly Dallying and Lollygagging Allowed! 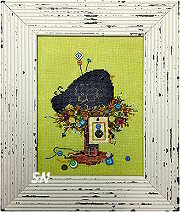 * What a fun piece that probably shouldn't hang someplace very serious!!! Worked on Weeks 30ct Charlotte's Pink with overdyed flosses, this finishes approx 5 x 15. 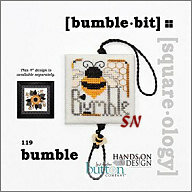 Garnish with the bumble bee button and a few other rounds... not much to this delightful piece... before you get to smile! 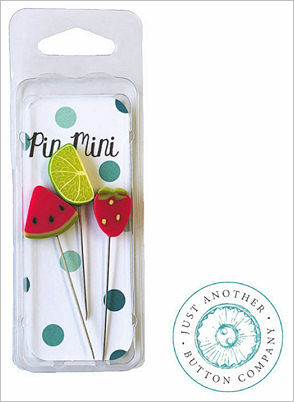 Offered as the chart with buttons -- and that fun flexible magnet from JABCO as well. 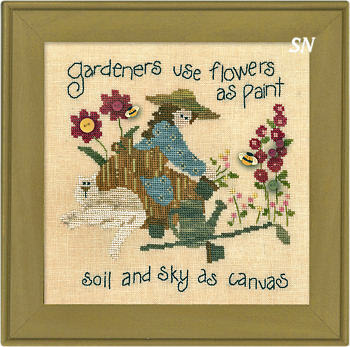 Just Another Button Company has charted the 4th block of Art to Heart's Garden song quilt... this one says *Gardeners use flowers as paint, soil and sky as canvas. * Stitch it for the one with the green thurmbs in your family! Stitched on the soft peachy Baby's Breath 30ct hand-dyed linen be Weeks Dye Works, it is charted for DMC or hand-dyed flosses, and is garnished with a small sampling of buttons and a pair of clay bees. 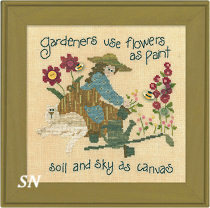 It finishes aprox 7-1/2 inches square... and has three other companion designs for the gardening-lover in your life! 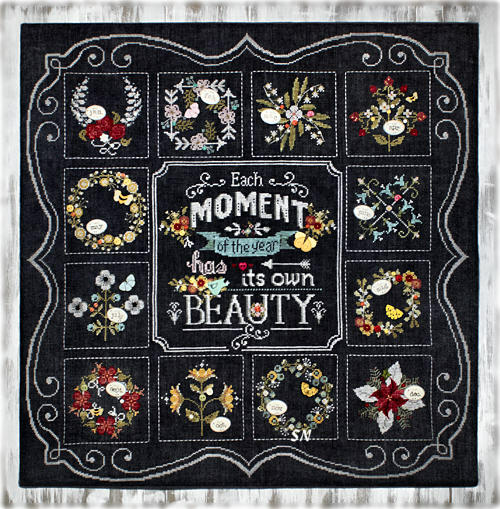 Just Another Button Company has taken another of Art To Heart's pretty applique patterns and converted it to Cross Stitch. 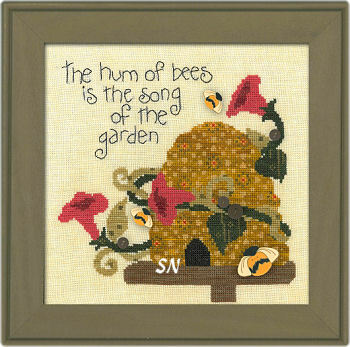 Third in the Garden Song series of designs... Spout was the first, and Bees Hum is the second, this happy piece is stitched on Weeks 30ct Sea Foam Linen in 8 different hand-dyed flosses. 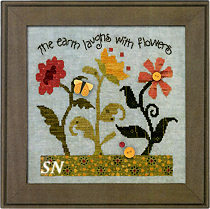 It finishes approx 8 x 8, and is garnished with the included button set. Just happy, rich colors of Lancaster Red and Copper, Grasshopper and Forest Glade, and Harvest Moon -- they aren't pale but strong and eyecatching. 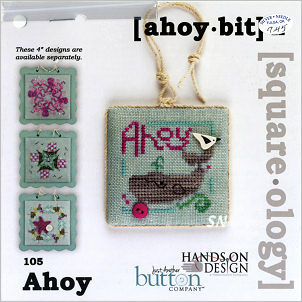 Offered as the chart with buttons, JABCO even adds a fun paper magnet in the package as a bonus! 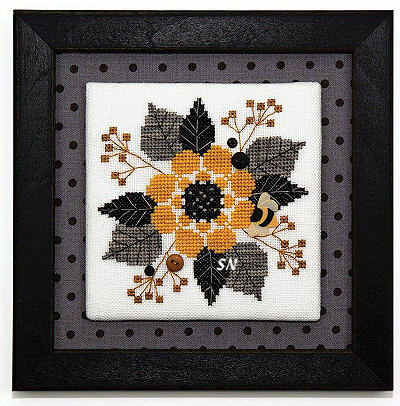 Art to Heart has a plump FLORAL beehive that Just Another Button Company has charted into Cross Stitch. Can you see the flower design in the hive? Stitched on Week's Dye Works 30ct Honeysuckle hand-dyed linen with 11 different hand-dyed or DMC flosses, the chart comes with the collection of button embellishments -- three bees and a smattering of deep purple buttons for the flower stems. 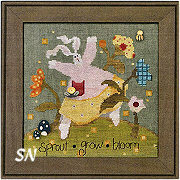 Art to Heart has a Garden Song Quilt design... this is the second panel of it that JABCO has charted for us. 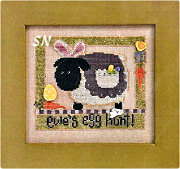 Finishes approx 7-1/2 inches square... I just LOVE that floral pattern in the hive, and the pretty collection of warm buttermilk and butterscotch colors against the Forest Glade and Tomato greens and reds! 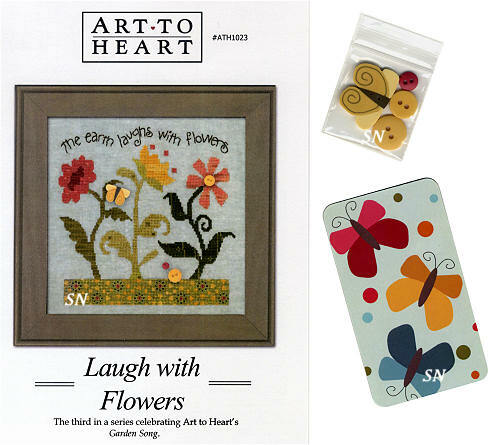 Art To Heart has a new cross stitch design -- Just Another Button Company has adapted it for them from one of their quilt/applique patterns!!! A pretty holiday piece -- you probably won't be displaying the finished piece this year... but next year's Christmas is already scheduled on the calendar -- so you have lots of notice! Stitched on Week's 30ct Parchment with overdyed or DMC flosses of reds, greens and caramel taupes, the chart includes a trio of clay buttons to embellish. 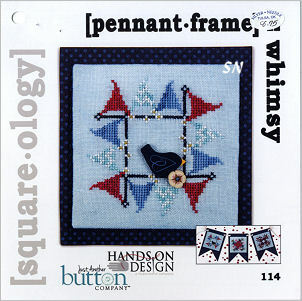 Just a pretty, contemporary design, they suggest that you frame this right up to the edge of your stitching -- to make it look kind of like a quilt block. Very pretty, eyecatching, fresh and clean! Offered as the chart with buttons. Just Another Button Company and Art to Heart have teamed up again to bring us 4 MORE cute quilt designs in Cross Stitch! Bittersweet Pumpkins features a pair of pretty spectacular pumpkins stitched in lots of gorgeous Autumnal shades of DMC, Weeks and Gentle Arts or Anchor flosses. 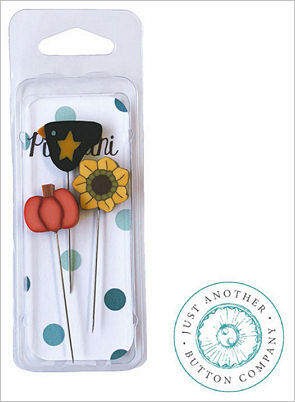 They've garnished with a small smattering of buttons -- but if your stash has some cute ones that are 'homeless' -- add them! 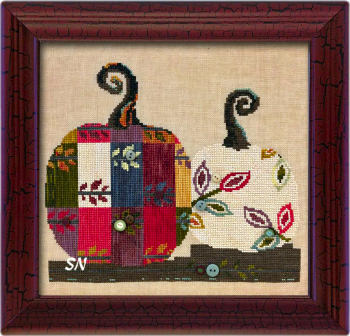 Stitched on Week's 30ct Parchment and finishing approx 8 x 9 ... you might want to look at Week's Straw or even Zweigart's Dirty Linen ... just a color that is a shade darker than that Parchment -- so the right pumpkin (which is stitched in GAST Peach Ice Cream) shows up better. It is WAY TOO CUTE to be lost against the background fabric, and I think it is now. 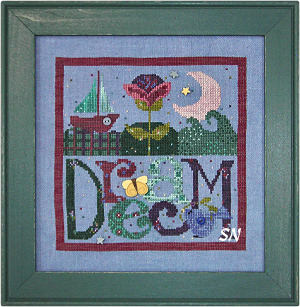 Anyway, adapted from Art to Heart's quilt designs, this is a beautiful piece of needleart! Offered as the chart with button set. This is a cute play of threads within the various letters. FULL of color, it's kind of fun to have the words in only two different colorways... but with tons of different shades in each. Some of the letters have patterns on them -- worked in a complimentary over-dyed shade -- look at the M. Some are stitched vertically -- can you see that in the E, S and A? And of course, the little white dots are cute as can be in the R, H and T.
This is worked with 13 different thread colors (Weeks, DMC or Anchor) on Week's 30ct Grasshopper Linen, and it finishes approx 6 x 6. 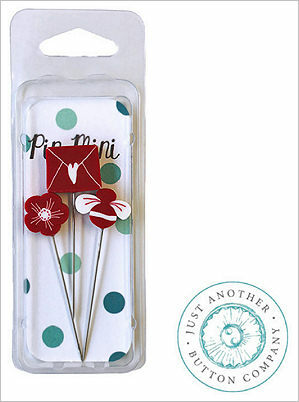 It is garnished with a simple red button and a pretty little cardinal. Oh this is CUTE! 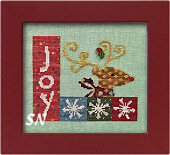 Look at how they've 'textured' Rudolph to make him look more like quilt fabric! 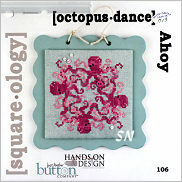 Stitched with 14 different shades of hand-dyeds, DMC or Anchor (You'll need 2 Pomegranate) this little guy finishes approx 5 x 6 on Week's 30ct Seafoam Linen. His buttons are simple -- just that red nose and a sprig of holly for his antlers. Very cute! Offered as the chart with buttons. At first I didn't figure out that the snowman and ornament were letters! Very pretty color detail in the H letters, I don't know how good my picture is... but they are filled with complimenting snowflakes. 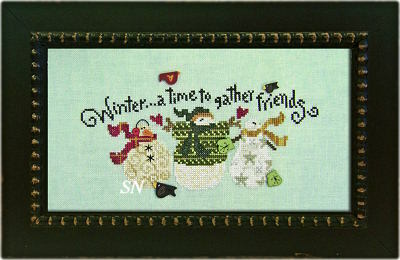 Then, the snowman is stitched with alternating rings of Picket Fence and Bluebell! I know that doesn't show up well -- but he looks great. 13 Different shades of hand-dyeds or solids, the button garnishes on this include a peppermint and berry on the wreath, black snowman eyes and that cute carrot nose, and the flake on the ornament. Offered as the chart with button set. 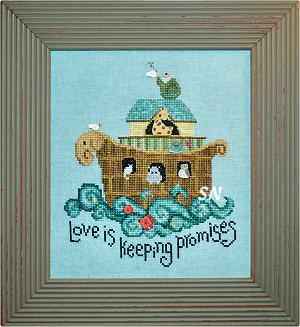 By Art to Heart, Just Another Button Company's adaptation from their quilt and fabric applique collection, Noah's ark is brimming with a family of animals amidst the rolling waves! 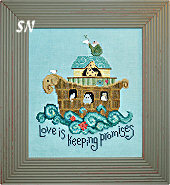 *Love is Keeping Promises* is the verse on this colorful 6-1/2 x 7-1/2 inch piece. 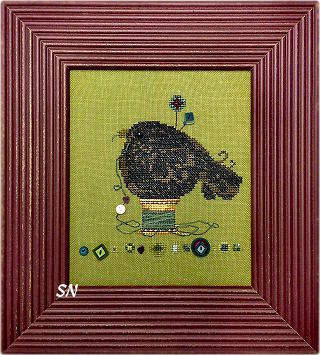 Stitched on Week's 30ct Seafoam Linen with 18 different Weeks and Gentle Art hand-dyed threads, the buttons that embellish include a pair of doves and gold fish, along with an owl, turtle and giraffe. There are a ton of animal buttons on the market... so if you have some others you want to include, there is plenty of room on Noah's Ark to add them! This would make a really cute nursery piece, or birth announcement! Offered as the chart with button embellishments. 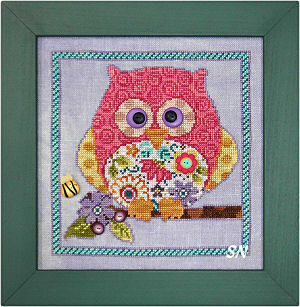 Another Art to Heart design -- originally published in applique -- Buzzing By is from the same book as our Curious Owl and Mischieveous Monster!!! A fat little bee is buzzing by the most glorious flower ever! Stitched on Weeks 30ct Seafoam Linen in 16 shades of Weeks hand-dyeds (or DMC or Anchor), every petal and leaf is stitched in a fabric design!!! 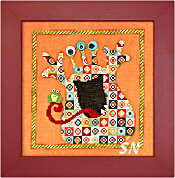 Just SO cheerful and colorful, it's truly a piece of stitched art! 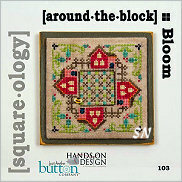 Finishing approx 7 x 7, the buttons are included with the chart. Very festive! 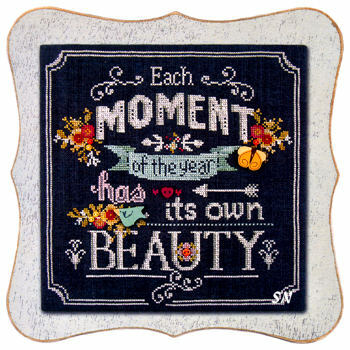 Just Another Button Company brings the quilted applique artwork of Art to Heart to the world of Cross Stitch with their design adaptations! Originally applique designs from the book 'Curiosities and Mischief' the JABCO ladies have charted the fabric designs adding color and pattern where-ever necessary to simulate the bright and fun fabrics used in the original quilted pieces. 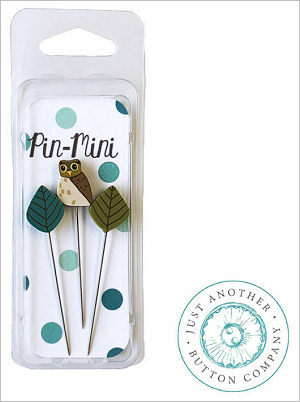 We LOVE them... the little owl sold out at our recent show booth at the St Charles Celebrations Show! 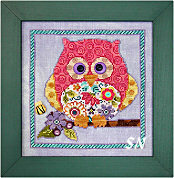 Curious Owl is stitched 30ct Lilac in a whopping 20 different color palette! 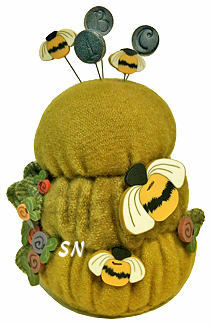 His button embellishments include his eyes, some berries, a cute pink flower and fat little bee. 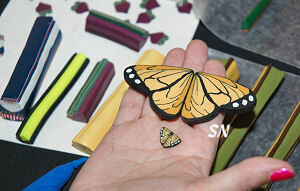 Both are stuffed full of cheerful color, and measure approx 7 inches square on 30ct. ABSOLUTELY THE CUTEST!!!!!! Offered as charts with button set. 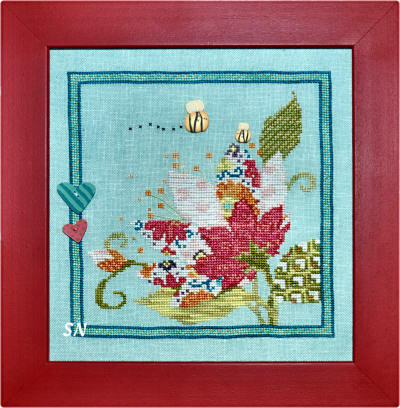 Another pretty adaptation from the Art to Heart artwork by the JABCO gals... this is stitched on Week's 30ct Dove linen... but we think it'd be STUNNING on a cream. 14 Different colors of Week's hand-dyeds or DMC flosses, Christmas is spelled down the left edge providing the first letters of short thoughts of The Christmas Story. Christ is born, honor Him. Inn... no room, Star shone. Three Wisemen, Manger bed, Angels sing, Shepherds watched. Everything is garnished with charming JABCO buttons -- the whole nativity, angels, the inn and star, three Wisemen, baby in the manger, and shepherd and sheep. There is a lot going on in this... and all of it is in a 4 x 13-1/2 inch piece!!! Very colorful and eye-catching! Offered as the chart with button set. 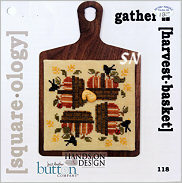 From Art to Heart's Acorn Hollow quilt design book... this very sociable witch might be inviting you to meal that you don't want to be a part of -- LITERALLY! 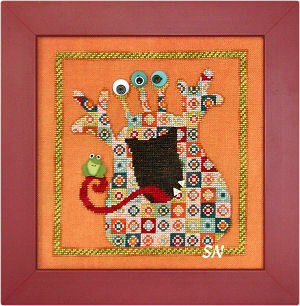 Very cute... she is stitched on Week's 30ct Kudzu linen in 12 different shades of Week's flosses. 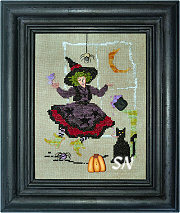 She is garnished with a frog, spider (I love how he's dangling from the word 'spell'), and calico pumpkin button. Lots of cute color, the lines in the black dress make it look like Art to Heart's original fabric colors in the original fabric design!!! 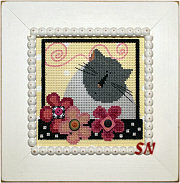 Finishing approx 6 x 7, this is offered as the chart with button pack. 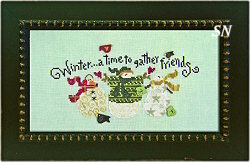 A charming bell pull by Art to Heart for JABCO, this is a quick stitch! Worked on Week's 30ct Grape Ice Linen in only 6 hand-dyeds or DMC, the BOO is actually two buttons, and I think the bat fangs are really the candy corn buttons! We carry that cool pewter hardware featured at the top of the hanger... from Charland Designs... and ours is still at a lower price than the new shipments!!! How can you be scared of that swirly ghost???! Offered as a chart with buttons. This companions BLOOM! A total overload of gorgeous colors and motifs, I love both of these designs!!! Color, randomness, larger-than-life motifs , and patterns in the floss colors to simulate fabric designs... this finishes approx 7 x 7 on Week's 30ct Periwinkle Linen. 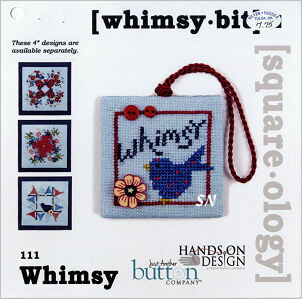 It features a button package of plain little circles and stars and that big 'ol butterfly. Offered as the chart with buttons -- SO UPLIFTING! 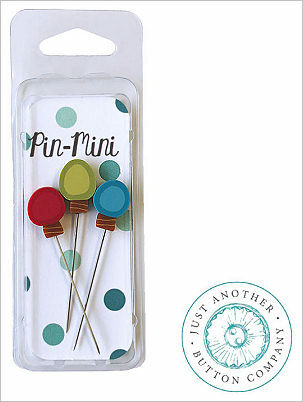 The entire 3-1/2 x 14 inch piece is adorned with a delightful set of Just Another Button Company buttons... including one of their new Stacked Buttons. The reindeer is actually layered with a belt and separate head piece! REALLY, really cute, this is offered as the chart with button pack. 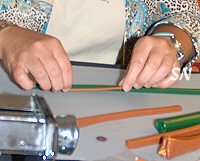 Fabric and threads are offered separately. Notice the Pewter Santa hardware across the pull's top? We have those!!!! Designed by Art to Heart and produced in pewter by Charland Designs -- he is just precious!!! A trio of tone-on-tone snowmen look like they're beating the chill by hanging out with each other! Stitched on Week's Dye Work's 30ct Sea Foam Linen in luscious overdyeds, DMC or Anchor flosses, add a clay nose here, a bird there, and a pair of errant mittens, and your 8 x 3-1/2 inch piece will be finished!!! Offered as the chart with button set, adapted by JABCO from Art To Heart's quilted applique artwork! 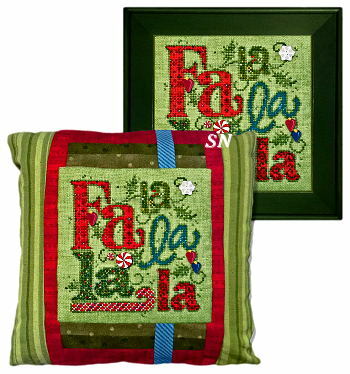 Originally a quilt pattern by Art to Heart... and adapted to Cross Stitch by Just Another Button Company... this is a colorful Christmas piece that mimics the charm of Art To Heart's patterned fabrics. FULL of pretty color, stitch this on Week's Dye Work's 30ct Guacamole Linen in either DMC, Anchor or Week's hand-dyed threads. Finishing approx 6 x 6, the piece is garnished with JABCO's buttons -- peppermints, a snowflake and some NEW mini twinkle light buttons. 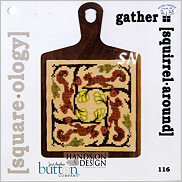 Huge on color and design impact... nobody is going to miss this piece among your Christmas decor!!! Offered as the chart with buttons. 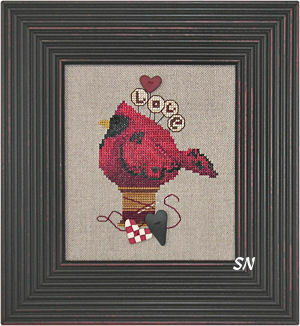 Art to Heart -- in Cross Stitch! 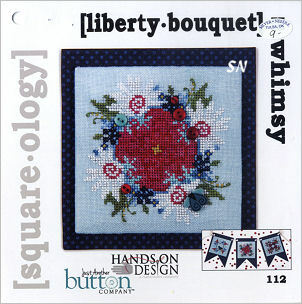 Just Another Button Company presents this delightful floral -- a Cross-Stitched version of one of Art to Heart's quilt patterns. 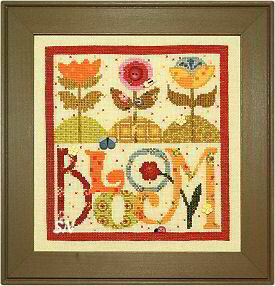 Offered as the chart with a set of 8 clay button embellishments, it is worked on Weeks Dye Work's 30ct Honeysuckle Linen in regular DMC flosses, with the exception of the Aztec Red you *can* choose for the brilliant border band. Stitch just one flower (about 2 x 4)... stitch all three (4 x 7)... stitch just the top or bottom sections of this or All OF IT (almost 8 x 8)! Just the most cheerful thing, the colors are show-stopping and FUN! Here's a stately guy just waiting and watching. 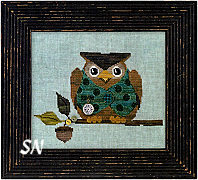 He's stitched on 30ct Weeks Seafoam linen in either DMCs or hand-dyeds. 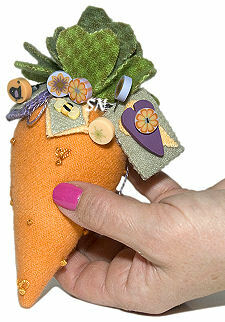 He is garnished with a pocket watch charm and a blue and black houndstooth oatterned button. He'll be part of a set of Woodland animals that can be stitched and framed or worked as ornaments on perforated paper. Offered as a chart with the buttons. 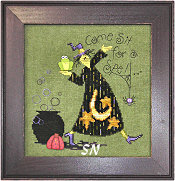 Here's a happy Halloween Witch kicking up her heels about her Halloween Brew! 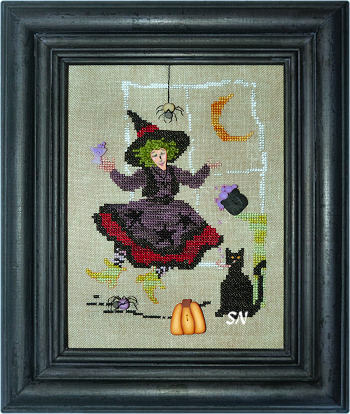 She's in front of a window, has lumpy green Wisper hair, and is embellished with a button face, bubbling cauldron and goblet of something from that cauldron... a pumpkin, and a couple of nasty spiders! Offered as the free chart WITH button purchase, this is stitched on Week's 30ct Confederate Gray with 9 shades of hand-dyeds, DMCs or Anchor flosses! A pair of blackbirds perched on their spools... go simple or extravagant... these little guys belong on the door to your sewing room! Offered as charts with their necessary button sets, each is stitched on Week's 30ct Grasshopper hand-dyed linen in lots of hand-dyeds or DMC flosses -- your choice. Approx 4 x 5 and 5 x 6... the buttons are cute, contemporary squares. 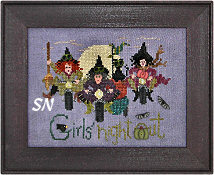 Just Another Button Company has a cute Halloween-y-themed design that celebrates A Girl's Night Out! 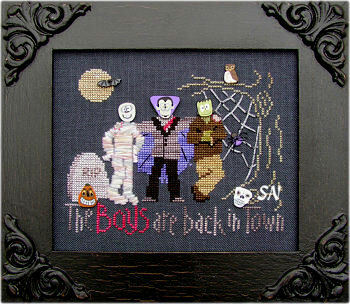 A companion to their long-time favorite 'The Boys are Back in Town', this is stitched on 30ct Weeks Lilac linen in overdyed flosses. The chart key suggests some Rainbow Gallery metallics and Wisper, along with wools if you like, to add some texture and fun to the finished piece. Finishing approx 5 x 6, since JABCO is the button designer -- you are purchasing the button embellishment set for this -- and getting the chart for free! Just cute fun! Oh, this is darling! It's one of Just Another Button Companies own sheep pin cushions charted into Cross Stitch. He is dressed as a Fortune Teller -- his face is masked in black, and he has on a purple shawl garnished with a moon and orange star. (yup, he has a gold hoop earring, too!) Little black feet and a big creamy rump round him out. 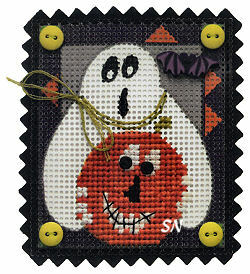 The border is garnished with a moon and dangly spider, and bits of spilled Trick or Treat candy from the little pumpkin pail. He finishes approx 5 x 6 and is just the cutest little guy! 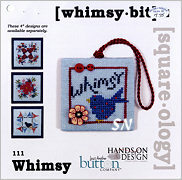 Offered as the chart with clay button set. 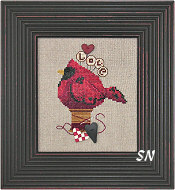 This is JABCO's little cardinal wool pin cushion -- in Cross Stitch! 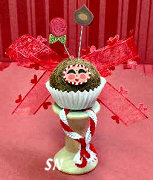 The plump little guy is perched atop a spool of thread and garnished with a few clay buttons. 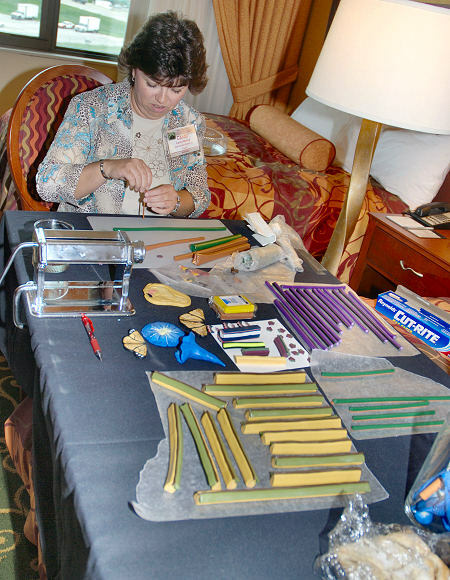 He's charted for either DMC or week's hand-dyed flosses, and he finishes approx 4 x 4-1/2. We were at the Celebrations show in St Louis last weekend... they LOVE their Cardinals!!! Offered as the chart with buttons. 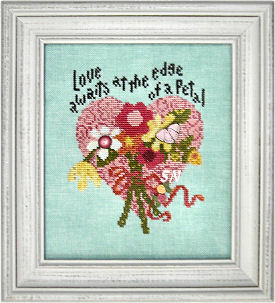 *At the edge of a petal* By Art to Heart, the JABCO girls have yet another adaptation to Cross Stitch that is colorful and uplifting. 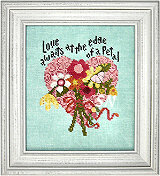 How pretty to hang in a Bridal Shop or Florist! How pretty as an album cover... a piece of needlework along side the framed wedding invitation... even a birth announcement! Charted for DMC with a few hand-dyed flosses tossed in, this finishes approx 5 x 5 on Week's 30ct Seafoam Linen. Butterfly and flower buttons adorn. Offered as the chart with button set. Remember JABCO's little wool sheep pin cushion -- the one that has the Easter Egg coat and bunny ears? 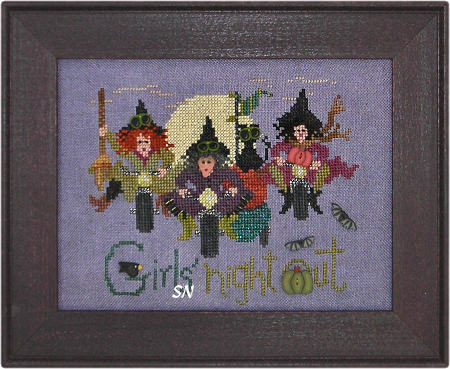 Well... here she is in Cross Stitch! 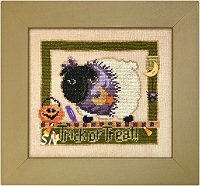 Same little sheep as the Trick or Treat Ewe... she finishes approx 5 x 6 on 14/28ct. You can skip the borders if time is an issue, but the whole thing is pretty cute, and that might be too hard! 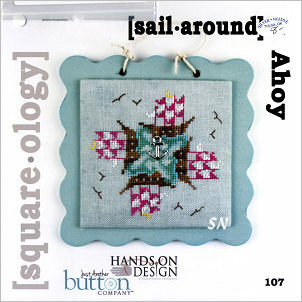 Button embellishments are included with the chart, which is coded for Weeks Dye Works, DMC or Anchor flosses. 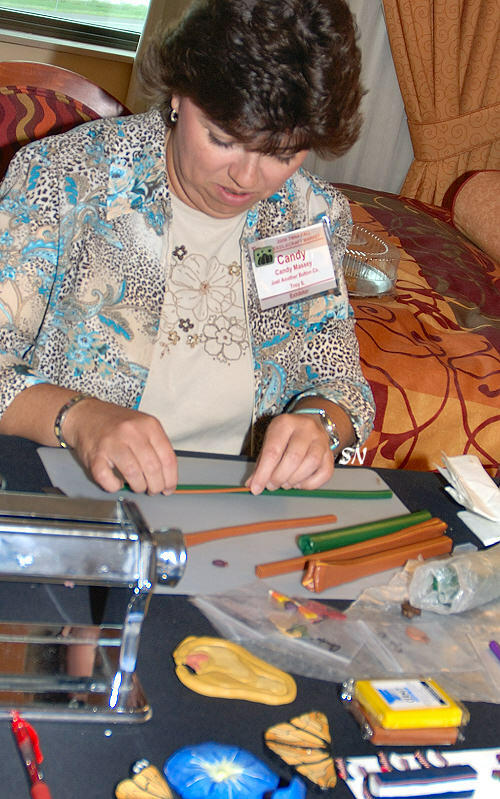 We have skinny pipe-cleaner legs, and we are just the most fun to take out of our packages to assemble. Cut those wool pieces a little, sew on our faces, and fill us with our genuine wool roving... twist our legs, and set us onto our seats... HERE WE ARE! We join our 5 Halloween Spoolie Friends, 5 Christmas Spoolies, and our 4 Peppermint Kings and Queens... please don't tell us who is your favorite... we're ALL the cutest! 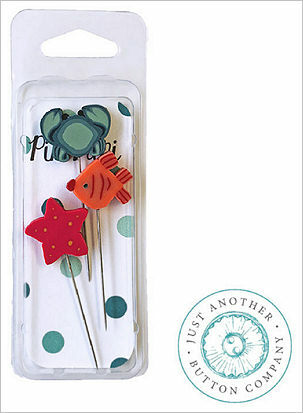 Just Another Button Company has a cute little spoolkeep pin cushion kit ready... with a few drops of glue, he takes 10 minutes to assemble. He's a Valentine Chocolate dressed in his crisp white paper *tuxedo*... and he's bringing you roses and chocolates!!! 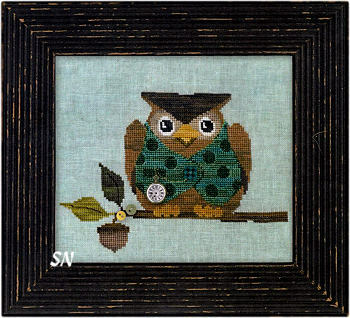 Oh my gosh... Just Another Button Company has sent THE CUTEST little 4 x 5 owl pin cushion kit!!! J Edgar begins as a round brown wool ball, stuffed with real wool roving. 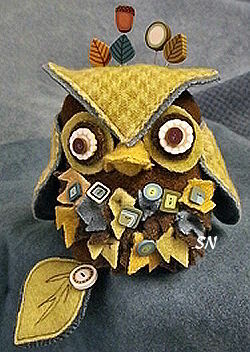 Next... you cut out all his feathers...sew his tiny chicklet stacking buttons together to garnish his feathers... stack the buttons for his eyes... and finally poke those leaf and acorn pins into his head! Offered as a complete kit of all the yummy olive greens, gold, teal blue and chocolate brown wools, you get all his buttons and pins... and complete finishing instructions. He is OVER-THE-TOP-CUTE!!!!! What a delightful little dish of acorns!!! This kit makes a collection of 5 wool-capped acorns -- each beginning with a 1-1/4 inch wool ball. 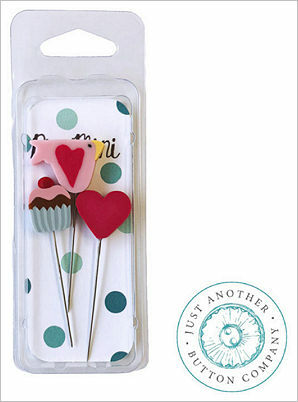 Soft rose, butterscotch, olive green, teal blue and a soft cocoa brown, each acorn is topped with a brown cap.. The leaves are teal and green -- they coordinate with the acorns! 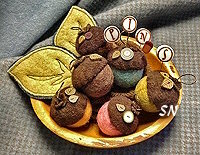 Just Another Button Company has been creating the most enchanting pin cushions out of Week's Dye Work's Wools, and garnishing them with their very own Just Pins! Each cushion design comes FULLY kitted with its pattern, wool pieces, some threads (some still need a bit of your sewing thread), wool roving for cushion stuffing, and its very own set of 5 clay-topped pins that stick right into your lovely creation! Check out the acorn, strawberry, snowman, blackbird and DARLING little heart box of stuffed chocolates! Way cute... nothing to do with Cross Stitch... except that every stitcher LOVES fun threats like these! To celebrate Just Another Button Company's 15 years in business... they are creating a set of 15 cushions that are releasing for 15 months in a row! JABCO the Snowman is #1, Stuck on You is #2, and Pin Feathers is #3. 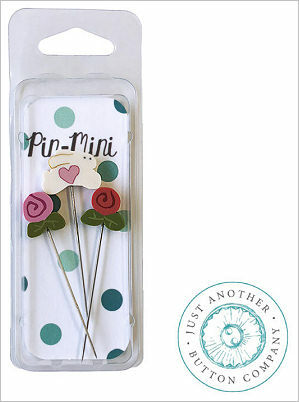 We're doing an auto-ship on these... they're just too cute to miss! Just Another Button Company's 11th in their set of 15 wool pin cushions has arrived... but we ate it! 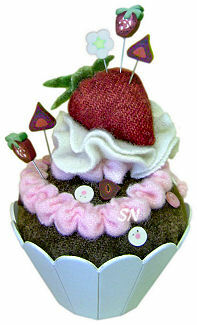 A chocolate cupcake decorated with strawberry icing and lots of whip cream... your pin cushion fits into a paper scallop-edged round and is topped with a wool ruffle of strawberry ice cream... even a fresh berry on top! The cushion is garnished with desert pins. See the berry blossom? 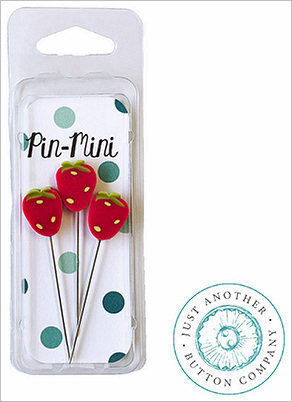 Next, two chocolate kisses and two more teeny strawberry pins. The cupcake is scattered with little round sprinkle buttons, as well. Just the cutest thing... I'm picturing this on the sales counter of any bakery or cute cupcake shop!!! And... it better be the Daily Treat Reminder for any family member's birthday!!! Complete kit includes all the wools, darling desert pins, all the cushion embellishments, roving stuffing, even the paper form to make the cupcake! 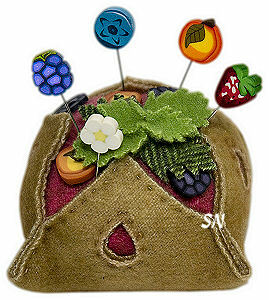 Just Another Button Company's newest wool pin cushion has arrived -- and it looks good enough to eat! A darling little fruit tart, the *berries* inside are a houndstooth wool, the *dough* on the outside is a perfect pie crust color... and all is garnished with peach and blackberry buttons, some leafy greens, and JABCO's set of berry pins! Measuring approx 3 x 3 x 2 , this is the 10th limited offering in their set of 15 pin cushions to celebrate their 15 years of business! Charming, our complete kits include all the instructions, all the felted Weeks Dye Works wools, and all the buttons and pins for the decorations. Our 8th buttoned wool pin cushion by Just Another Button Company has arrived! 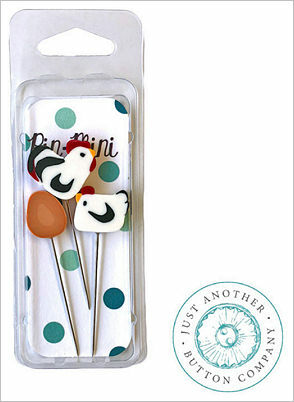 PERFECT for a *chicken kitchen*, or perched on a small shelf, this is 'The Perfect Poultry!' Perched atop a wooden spool, the fabric body is topped with a wool head and tail feathers... and poked with a matching set of flower-topped pins. Very cute, great colors of cream, brick red, denim blue and butterscotch. 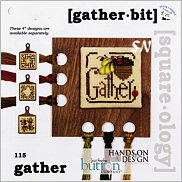 Offered as the complete kit, you get all the patterns, fabrics, wool roving for stuffing, the wooden spool and all the buttons, beads for eyes, and pins! No machine sewing involved, either! 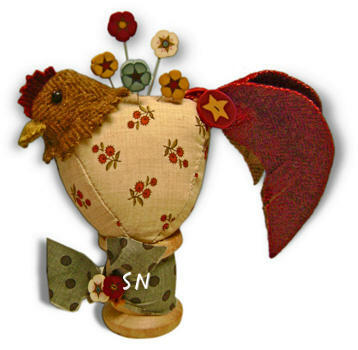 Too cute, Rustic Rooster stands approx 5 inches tall. 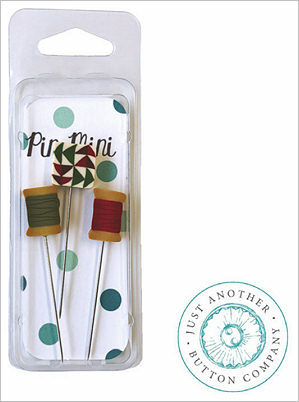 The 7th wool pin cushion in this delightful collection has arrived! Absolutely the most darling little hive of activity, the trio of tufts stands approx 4 inches high, and a chubby 3-inches wide. Made from Weeks hand-dyed solid and houndstooth wools, the complete kit comes with the wools for the hive and leaves as well as the wool roving stuffing inside. You also get all the flower buttons -- 7 of those, 2 bee buttons, and the pair of bee stick pins with 3 embossed alphabet pins, too! Full instructions include all the templates for all the shapes. So CUTE! 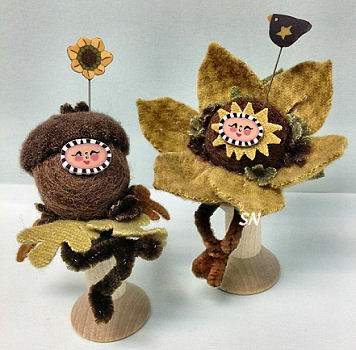 Just Another Button Company has a new felted wool pin cushion that sports lots of their cute clay buttons and pins. This delicious little pod is made with a bit of Weeks Herringbone wool, just tiny nips and tucks, and then filled with 4 balls of wool to make the peas! 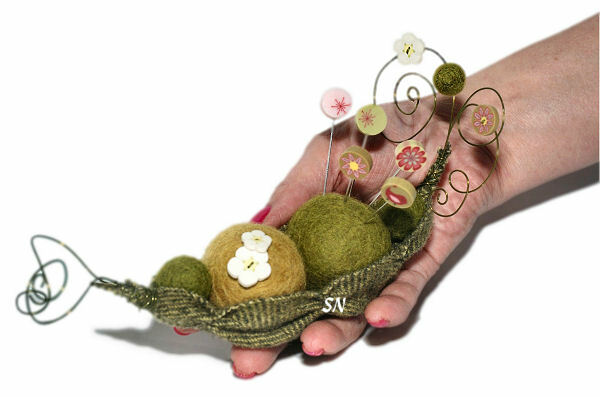 The complete kit comes with instructions, the ready-made perfectly round wool balls, green wire for the decoration, and all the clay blossoms and pink/green flower pins for garnish. 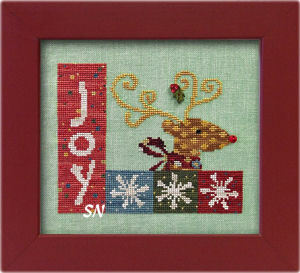 Finishing a generous 5 inches in length, this would be awesome perched on your kitchen windowsill! It is cushion #6 in JABCO's series of 15 cushions to celebrate their 15 years in business! 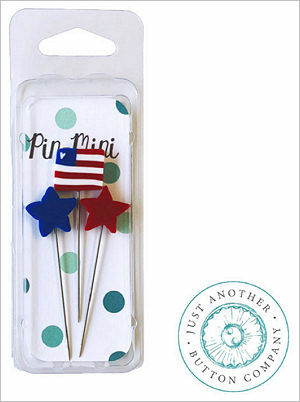 Just Another Button Company's 4th in a set of 15th Birthday Pin Cushions... Carrot Patch is a DARLING little wool carrot that sports Houndstooth greens, a trio of 'tags' featuring clay button embellishments, and a charming set of lemon, lavender and orange Just Pins! 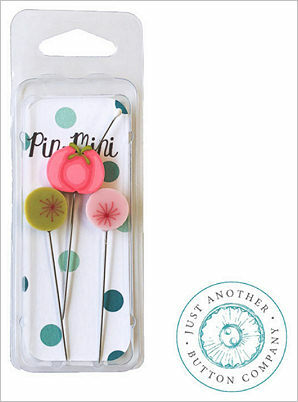 This series of pin cushions is endearing! 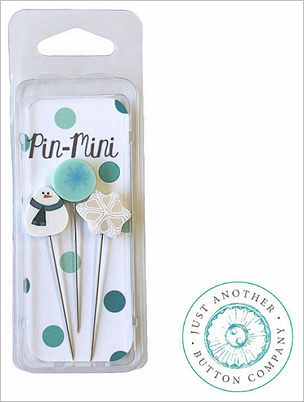 Offered as COMPLETE kits of the pattern and assembly instructions, you get all the little Weeks hand-dyed wools, the wool stuffing, all the clay embellishments, all the perle cottons and such to construct AND the set of Just Pins -- the decorated pins to poke into your precious handmade miniature work of ART! (Just Another Button Company is celebrating 15 years of business this year... this is the 4th release in their *15 and Fabulous* Birthday celebration!) The little carrot measures approx 6 inches from tips of greens to tip of carrot, and approx 3 inches wide. There really isn't anything hard to do to put this little thing together -- as a non-sewer, it scares me to death, but as a creative, hand-made kind of gal... I can DO these! 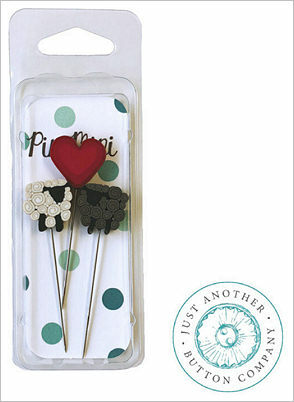 By Just Another Button Company, this set of 5 sheep pins caught my eye... so I just had to have them!! 5 Small white sheep, each is decorated with a quilt block or little what-not. Be sure to scroll all the down to the bottom of this page to see lots more of these! 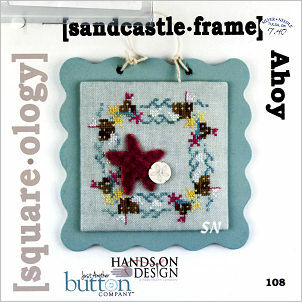 Just Another Button Company has a new freebie chart that is a real show-stopper! Hey -- some new bachelors to choose from!!! Stitched in overdyed flosses on Weeks 30ct Gunmetal Linen... your three gentlemen have great heads on their shoulders... so you couldn't go wrong with any one of them! Finishing approx 5 x 6, the chart is a freebie WITH the purchase of the Just Another Button Company clay button set. So Darn cute, it's SCARY!